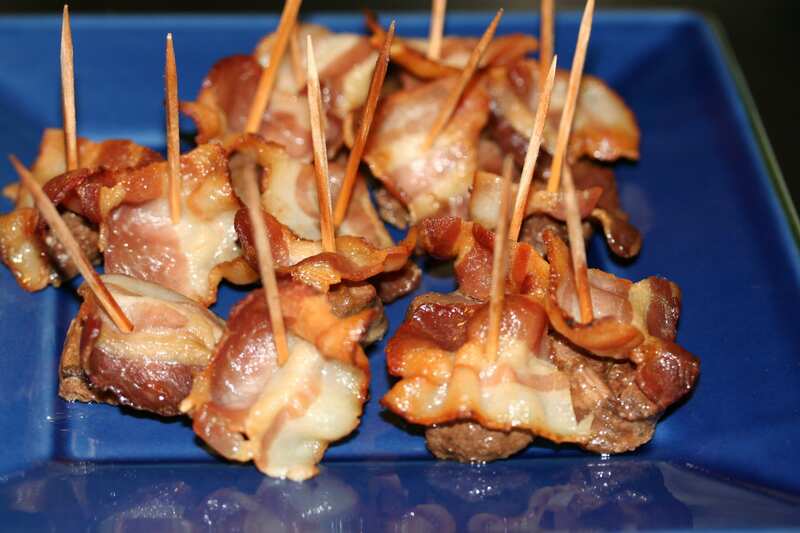 These tasty morsels are a perfect appetizer and a quick way to cook up duck or goose breasts. 1. If using frozen meat, defrost duck or goose breast in the refrigerator overnight. 2. Cut meat into bite-sized chunks. 3. Place meat in a non-reactive bowl and pour the dressing/marinade over the meat. Stir to evenly coat the meat. Let marinate in the refrigerator for a few hours or even a few days. 5. Cut bacon into 1 to 1.5 inch pieces. Remove duck from the marinade and place a piece of bacon on top, securing it with a wooden toothpick. Place it on a cookie sheet and repeat with remaining duck and bacon. 6. Bake for about 10 minutes until the bacon is crisp and the duck is cooked through. Sounds really good, I’ll have to give this one a try!